Although a great many flies for yellowfish and trout were covered in FOSAF’s five-volume series, Favoured Flies and Select Techniques of the Experts, only one imitated a very prolific insect in our rivers and streams, the blackfly larvae. Keith Wallington produced the pattern and like all imitations up to now it had, in my view, a fundamental failing and that is that it did not reproduce the Coke bottle shape of the natural. Underbody: Lead for quarter of shank; entire shank covered with thread except lead wire section marked with dark/brown charcoal marker. 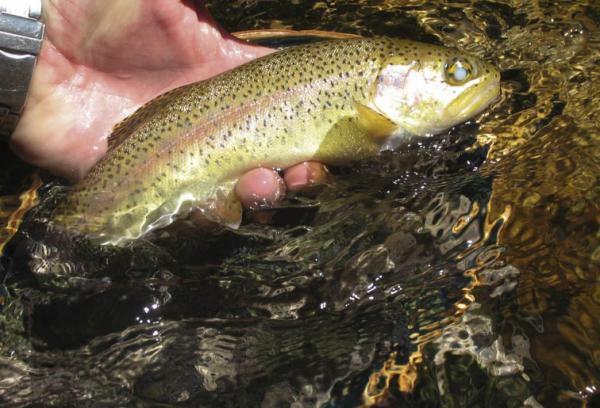 Keith’s article was probably written about five years ago and, since then, the UV light-cured resins derived from dentistry products have made a significant contribution to fly tying. It was while tying some yellowfish flies for my friend, Cape Town split cane rod builder Steve Boshoff that I had a bit of a Eureka moment. Steve was about to set off on the annual jaunt to the Richtersveld organised by Cape Town guide Tim Rolston and the pressure of work had prevented him from tying flies for the trip. I discovered that using UV light cured resins made tying Brassies very easy - slip on the bead, wind on the wire, apply the resin and cure it and then comes the first and only thread-based step, adding a dubbed thorax. 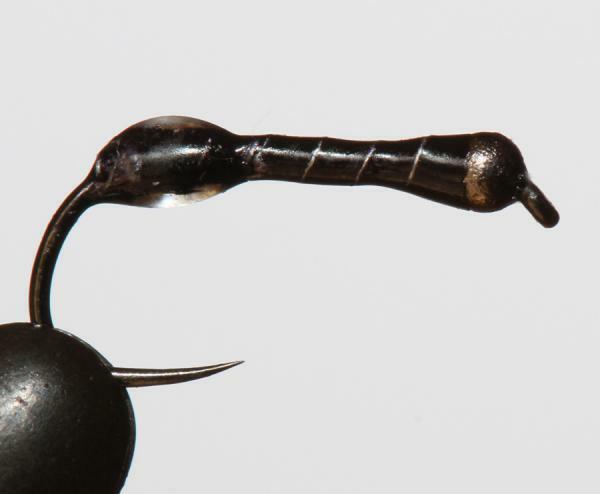 It then occurred to me that if I used a 1.5mm black tungsten bead and fine black wire on a #16 Grip 11011BL hook I could have a useful imitation of a Simulid larva. That was when I made an even more interesting discovery. The UV light-cured resin enables you to sculpt the coke bottle shape by applying it where you want on the hook shank and curing it as you go. I get my epoxy from Morne Bayman at the African Fly Angler but there is little to choose between the various brands and Loon is probably the most widely available brand. 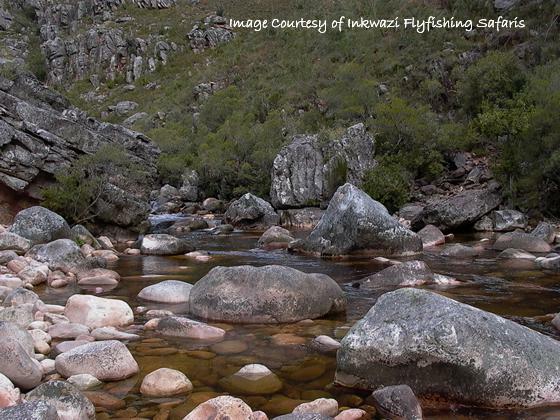 It was first fished Tom on the Lourens stream in Somerset West in a very bushed-in section. He only had two BF nymphs. Taken first cast and then lost the fly in the trees. Put on the second one and was taken first cast and then lost the fly in the trees. Andrew Ingram was the next to try the nymph and was impressed with the success of the fly on Elandspad beat 2. He took fish after fish. Among them was the biggest fish he has ever caught on our streams which broke him off after eight jumps. He then tried some #16 red and green Brassies which I had tied for him. They were ignored. He went back to the Simulid nymph and again started taking fish after fish including one which was blind in one eye. Keep in mind that this fly could also be seen by trout as an ant. The Simulid Nymph takes about three minutes to “tie”. I tie a second version for when the water is low. It uses a 14/0 black glass bead instead of 1.5 black tungsten and with ultra-fine black UTC wire replacing the flat lead. Up to now, however, the imitations of the blackfly larva in the US have been poor - dubbed bodies, silver wire rib etc and they have not imitated the distinctive body shape of the natural. The UV-cured epoxies have made possible what could be a big step forward in this regard. Andrew says the fly casts well into the wind, has a quiet entry and sinks quickly.